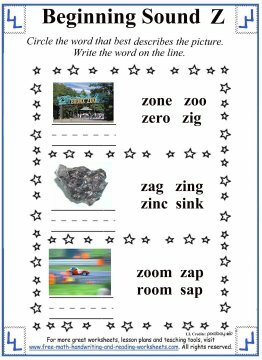 These letter Z worksheets are a great way to teach your child about the /z/ sound. 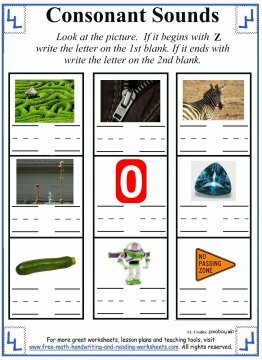 While these activities focus mostly on the sound that the letter makes, you can find more lessons covering how to write the various letters of the Alphabet in my printing and cursive writing section of the site below. 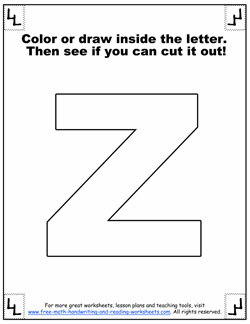 For now, let's take a look at the worksheets covering the letter Z.
Click on an image below to open up a PDF in another tab. From there you can print or download the file. Each paper has instructions on it, but I'll cover each in more detail below. 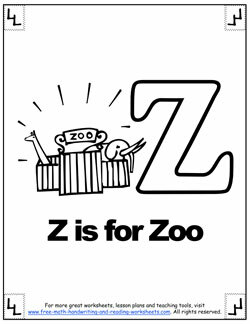 The first paper is great for younger Preschool children just beginning to learn their Alphabet. On the left of the printout is a picture with the letter Z and a word. Say the letter, the word, and make the /z/ sound. Have your child repeat after you. On the right are four pictures. Name each picture and then circle the ones that begin with Z. 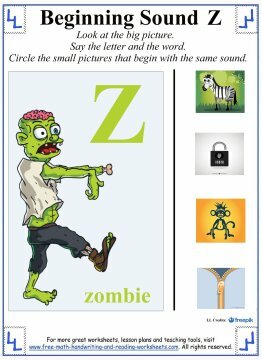 The next printable shows three pictures next to a group of four words. For each picture, determine which word best describes it. Circle the word and then write it on the line. The next activity has nine pictures on it that either begin or end with the /z/ sound. Name each picture. 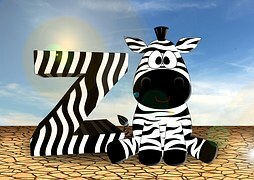 If it begins with Z (zipper, zebra, zero, zucchini, zone) write the letter Z on the first line. If it ends with the /z/ sound (maze, fizz, topaz, Buzz) write it on the second line. The fourth sheet is a rhyming activity. In the top box are four different Z words. Below that are four boxes with words that rhyme. Help your child to write the words that rhyme in the appropriate box. At the bottom of the paper are two sentence writing tasks. 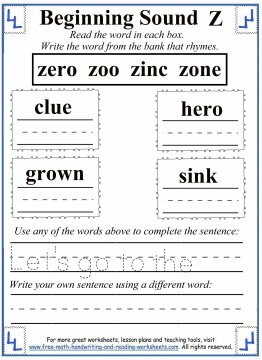 Use one Z word from the box to complete the first line and another word to write an original sentence. The last two printables are simple coloring worksheets. The first of which comes from my coloring pages covering the phonetic alphabet. The second is a printable letter page that can be decorated with glitter, pom-poms, macaroni, or just about anything that your child enjoys working with. Have fun!